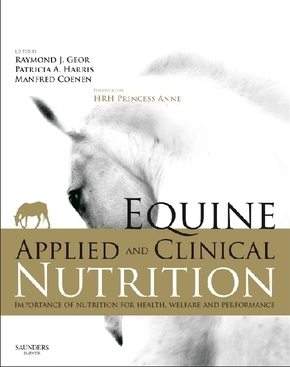 Equine Applied and Clinical Nutrition is a landmark text that provides a comprehensive source of information on the nutrition and feeding management of horses. In this authoritative and accessible account, experts from around the world provide a global perspective while the editors tackle key controversial areas. Topics covered include the basic foundations of equine nutrition (digestive and metabolic physiology, nutrient functions and requirements), nutritional management by life stage or function, the assessment of feedstuffs and feeding programs, and clinical nutrition. Also included is discussion on feed hygiene and the role of manufacturers in feed quality and safety. The book contains abundant practical nutritional advice for the treatment of clinical conditions seen by veterinarians in their daily practice, together with the fundamental information needed to make recommendations for the nutritional management of healthy horses. Equine Applied and Clinical Nutrition provides the most substantial overview currently available of the nutritional management of key equine clinical conditions. It further presents the up-to-date scientific background needed to underpin recommendations. It will be of core relevance to equine veterinarians and nutritionists, and a valuable resource for undergraduate and graduate students, as well as lay horsemen and women who wish to be better informed about their horses' nutritional needs.